The media business moves in ever-faster, shallower coverage cycles, pursuing stories with a simple tension that creates a sense of urgency in readers and viewers such that they will stay for the commercial, buy another issue or click into the full story. The speed of the news cycle and the need for this clear, simple tension obscures even the most important stories once they evolve past urgency into more subtle or complex territory. 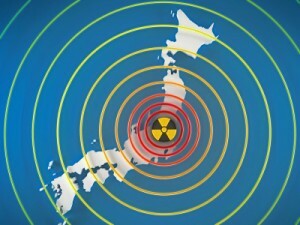 Take the Fukushima nuclear disaster. It’s been a year since the tsunami hit and the multiple reactor meltdown incidents, so the story is getting a brief, anniversary return trip to the news cycle; a trip down disaster memory lane, some “lessons learned” and some heartening bits on people rebuilding. There is a story to be told about the ongoing disaster in Fukushima, an important one that might prompt a very useful discussion about the role and shape of nuclear power in the United States even as the first new plant in over 30 years is licensed in Georgia. But the story out of Japan has become more complex and open-ended, lacking simple tension, a clear ending point and gripping images of containment buildings exploding and helicopters dumping seawater on seething rubble. After Fukushima Daiichi exploded and melted down, a consensus emerged that, while terrible and problematic, the damage was ultimately manageable and nuclear power a safer choice than many traditional power sources. Coal, for instance, was calculated to have killed many times more people per watt of electricity generated than nuclear. Coal mining has killed lots of miners over its long history as a leading energy source and its use has certainly resulted in types of air pollution that have a well understood casual relation with life-shortening conditions such as asthma. Clear and simple. Less clear and simple, however, are the mortality effects of long term exposure to various types of radioactive fallout and debris. Radioactivity at lower levels is invisible to human senses. Tracking radioactive fallout and its effects is bereft of the clear and simple tension that the media relies on to drive news cycles and its bottom line. Oh, you can still find those efforts happening, they just won’t be part of the news cycle informing our public opinion and debate. For the link averse, the early indications from Fukushima are not comforting. Take this podcast interview, for example. In it, it is noted that a medical examination of almost 4,000 school-aged children showed thyroid “lumps” in about a third. Apparently that’s rather unusual. Those kids aren’t dead; they may well live on just fine for decades. If they are, perhaps, tracked by curious medical investigators or scientists and found to have shortened lifespans due to increased incidents of cancers often associated with exposure to radioactive isotopes that may generate a story or two. But those stories will not inform our current understanding of the dangers posed by nuclear power and the handling of its associated waste. Some other story with a more clear and simple tension will be driving the news cycle. Count on it. When the sun doesn’t shine on the beach it wrecks your tanning index. When the sun doesn’t shine on your solar panels you’re taking cold showers and eating soup out of the can – assuming you have a manual can opener. The same goes for wind power. A wind turbine is a fine thing when the wind is blowing, but when the wind isn’t blowing the turbine is an overgrown, albino lawn flamingo. Tidal power is not as flashy as solar and wind, but it’s insanely reliable. Tides come in and go back out without fail, no matter whether it’s cloudy or sunny, windy or calm. As they flow in and out, tides generate huge amounts of energy that can be converted into a predictable renewable energy stream. By mid-March, up on the northeastern tip of the U.S., in Lubec, Maine, a company called Ocean Renewable Power Co. will begin operating the first grid-connected tidal power plant in the U.S. 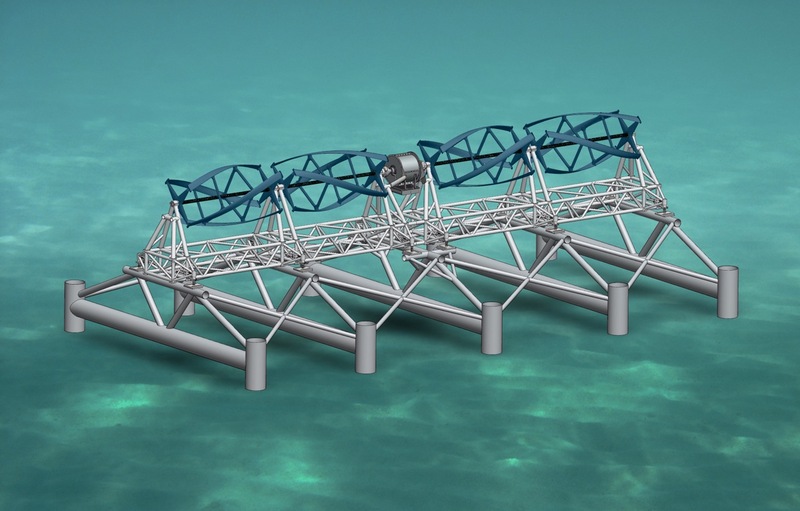 The 300-kilowatt (kW) tidal energy project consists of turbine generator units (TGUs) mounted on the sea floor. The 20-foot tide drives the turbines as it ebbs and flows. Check out what the Portland Press Herald wrote about the project. The coverage has a lot of good details. Ocean Renewable’s Cobscook Bay Tidal Energy Project or is a fairly small pilot program that will produce enough electricity to supply 100-125 homes. 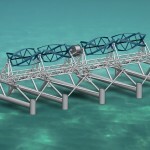 The project’s larger purpose is to help determine the feasibility of larger-scale tidal power. The outlook is good, but what jumps out at students of renewable energy is what Ocean Renewable CEO Chris Sauer said about tidal power’s likely future. “It’s never going to be the dominant power-generating resource in the state of Maine, but it’s going to be a significant contributor,” Sauer said. Dissect Sauer’s observation and you find the likely shape of our energy future. Most of our energy won’t come from massive, centralized power plants like we have today because none of todays’ renewables have the energy density of fossil fuels. Instead, we’ll get electricity from a larger number of smaller renewable sources, each doing what they do best. Solar and wind will produce when the conditions are right. Tidal, biomass and players-to-be-named will fill in the gaps. And we’ll be consuming less because our homes, appliances and vehicles will be more efficient.